Or shall I say, Mommy's experience in dealing with teething baby? First and foremost what I can say is it did involve a lot of patience, and tears! Amani started teething when she was four months old. It was difficult. 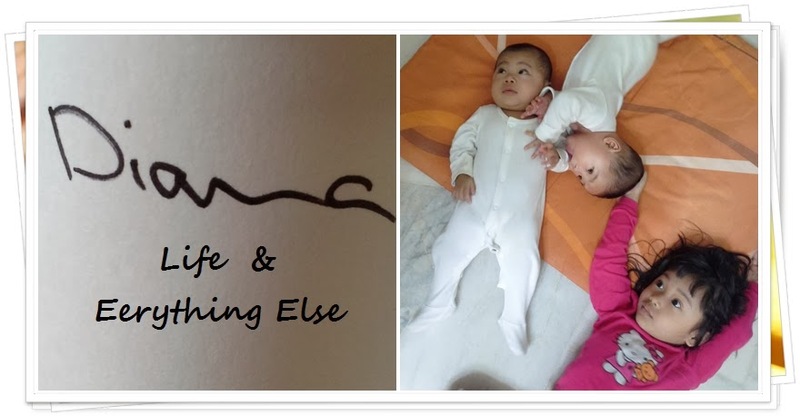 It involved a lot of crying, sleepless night with endless crying, high fever, diarhea and drooling with rashes on her face. I must be honest - as mentally prepared as I was for other things, I forgot teething. For some reason? How could I have forgotten that some day my baby will have teeth *smile*. Mommy's getting old I guess. Some information on teething...What is teething - exactly? As defined by Wikipedia - "Teething is the process by which an infant's teeth sequentially appear by breaking through the gums." As early as 3 months. Yes, and could be as late as 12 months. Every baby's or child's development is different so you need not worry :-). Mine, now at the age of 11 months she already has six. Well like I said every baby is different. Let me tell you mine. First of all, know that some baby doesn't even show any symptom! Amazing, right? Ayesha Amani became really really fussy especially at night. Nothing could ever be right. No teether could do her good except for biting her hands. Believe you me, I had bought 5 kind of teethers and only the last one (which i bought at Ovo, The Curve for RM19.90) which she liked and worked for a while. Yes only for a while. She also had very high fever (39 degree celcius) and developed rashes near her mouth where she drools. Due to the high fever she also had diarrhea for days! I couldn't, at first! It was very emotional because this girl is the type that can't be consoled just like that! I mean you can never tell her "it's ok honey mommy is here", and then hold her in your arms, feel your warmth and everything. She is the type that needed effort! The first night that she cried non- stop I couldn't handle it. I broke down and cried and left her to cry in my arm, tried patting her back- didn't work. People said try Gripe Water but my baby just won't swallow the thing! She finally stopped on her own. This was when I decided to prepare myself better. The next day I looked up information on teething - simply trying to understand how my baby must have felt! I needed to get the feel of it in order for me to manage the pain. Apparently it is very painful. Imagine even us adults can't really handle toothache. These babies, even worse. They can only communicate their discomfort through crying. I put her teether in the chiller so that when her gum feels uneasy and she starts biting, she has a cold teether (the fifth one I bought, remember) and it will stop her from crying. But this doesn't always work. Sometimes she just prefers biting on me, and I'd just let her if it stops her from crying - because crying leads to bloating! She also prefers hard stuff rather than rubbery staff. For example if she found a hair comb, daddy's watch, it will be much consolation to her. At times when she had reached 6 months, I gave her cold fruit (not bite size but bigger because I needed assurance that she can't bite to cut and swallow the fruits). Apples and pears worked for her. Sometimes I intentionally gave her cold avocado. Even though she cringed when eating, it stopped her from getting cranky. Other methods, suggested on the net didn't work on my baby. She's a tough one this one. Though I now understood her pain sometimes I still can't console her midnight crying. I know I am comforting to her now though, that I can't leave her side when teething gets too painful and fever gets too high. Just to share on some methods found on the internet, among others, i)infants' acetaminophen (by prescription) , ii)Rubbing baby's gum , iii)Cold carrot , iv) Cold washcloth and so many more. Look 'em up on Mr Google. How did you deal with yours? Mind to share?